Nest of 3 Tables. Grey Finish. Manufacturer Core Products. Product Details. Product Features. Small enough to place next to an armchair in your dining room, yet large enough to hold your tea set and newspaper! These 3 tables are the practical and stylish solution for your living room. Nest Of Tables 3 Coffee Table Units Square Side Lamp Furniture Living Room. Type: Coffee Table. Stylish Design is suitable for your modern living room. Coffee Table. Main Colour: Black. 1st: 600mm(Width) 600mm(Depth) 500mm(Height). Coffee table. Stylish design is suitable for your modern living room. Main Colour: White White Glass. Multi-high gloss painting makes it much easier to clean. Material: MDF Glass. Top quality MDF materials. Space saving and stylish these tables are functional and versatile! Works perfect as accent tables in your living room or bedroom. Wooden legs and MDF laminated white top. Set includes Two (2) nesting tables. The tables can be used as side tables, coffee tables, lamp / plant stands, etc. Being stackable, these tables save a lot of space when not in use, or can be decoratively arranged. Colour: Multicolour. The Charisma High Gloss Range is an up to the minute collection of linear styled bedroom furniture boasts a striking high gloss, scratch resistant finish, resulting from the application of several layers of premium quality lacquer to a substantial MDF core. Fit for: Study room, living room, bed room. Type: Coffee table /End table. Combines with minimalism inspiration and smooth lines design, this table can bring vogue and elegance to any traditional and modern house. 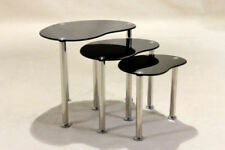 This is our newest Coffee Tea Side Table Set. The set includes three colors——White, Yellow and Blue, making it very eye catching in your room. Minimalist design for most household style. Simple assembly and maintenance. Model: Rainbow. Lovers of modern design will love this side table. Do not use harsh household cleaners or scouring agents. Colour: Blue/Pink /Yellow (with white legs). Style: Modern. Simple and clear assembly instructions are included. The Indiana Rosewood nest of tables is a fantastic item to have situated next to your sofa or chair set. With a light, compact design, the side tables can easily be moved around if needed. All the timber is kiln dried and treated to ensure stability before production begins, however as each piece is hand finished, variation in knots, grain detailing and minor imperfections may occur, these are not faults and are considered part of the uniqueness and character of the furniture. Solid Oak Nest Of 3 Tables. please note this is not a flat pack I can’t get it off the listing. The item is solid oak. Selling due to house move. Good condition. Collection only. John Lewis Nest Of Tables - Solid Wood. Condition is Used. Colour: Walnut (with walnut legs). Model: Walnut Rectangle. Lovers of modern design will love this side table. Do not use harsh household cleaners or scouring agents. Style: Modern. Simple and clear assembly instructions are included. 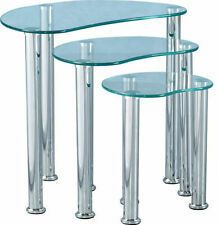 The glass nest of tables comprises of a set of three matching tables that slot neatly. The black glass nest of tables features a glass top, a beautiful design that will look excellent within contemporary decor modes and uniquely. The tables can be used as side tables, coffee tables, lamp / plant stands, etc. 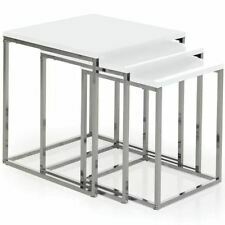 Being stackable, these tables save a lot of space when not in use, or can be decoratively arranged. Great care is taken at every step of the production process, be it recombining, polishing and painting. Handy stands: All 3 plant stands provide plenty of space for your phone, books, magazines and more. Colour: Black. Matching: Use the 3 small accessory stands for your living room, hallway or bedroom. Large Table: H 53 x W 30 x D 50.5 Cm Approx. 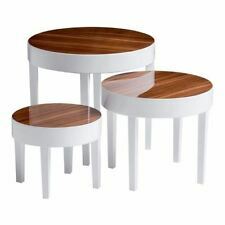 Title: New Nest 3pcs Round Coffee Modern Furniture Side Tables Matt White Furniture UK. The coffee Tables With pine Legs. A very stylish Retro type round coffee. perfect for your living room, guest room, dining room as well as for your kitchen. Stylish design Extra surface space Compact storage Durable and sturdy Everyday use Dimensions (W x D x H): 55 x 45 x 50cm . Black Glass Nest of 3 Tables. Condition is Used. 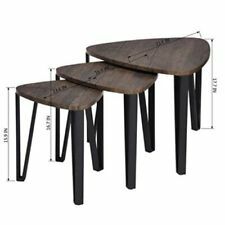 Product Details: Package Size: Three coffee table Material: Wooden top with metal legs Style: Retro & Industrial Color: Walnut&Black Overall size: 21.1''*21.1''*17.7''/16.5''*16.5''*16.7''/13.6''*13.6''*15.9''(L*W*H) Assemble Required: Yse (easy with intrustion paper) Features: This brand new modern industrial style nesting coffee will be a stunning focal point in every contemporary living room. With unique trangle and nesting design, it can help to save some space when not using. Manufactured from enviromentally friendly wood and strudy metal legs. Smooth curved corner round edge of the desktop, safe for kids, more secure and practical. Plastic non-marking foot can prevent scratching floors. Cash on collection( item very heavy due to solid construction). Nest Of 3 Glass Tables. Condition is Seller refurbished. 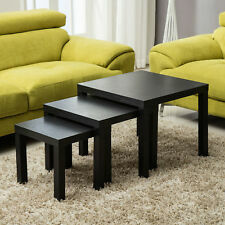 Give your living room an earthly feel with the Nest of Tables 3 Tables 2 Small 1 Long Mango Hollow core Living Room. Nest of Tables 3 Tables 2 Small 1 Long Mango Hollow core Living Room. Quick Code: G-JAKNSTMNG Nest of Tables. Model: Charisma White Nest of Tables. Charisma Nest of Tables. White gloss finish. Modern Square Style. Finish White. Lovely unusual nest of three tables The two smaller tables side under one from either side. Lovely tall legs makes ideal lamp tables. There are some scratches on top as shown. Main table 66cm tall. Top 62cm X 44 cm Would possibly make a great up cycling project. It's NOT flat packed. Very solid. Nest of 2 Tables - Solid Wood Oak. Condition is Used. Larger table has small discoloured stain. Please see pictures. Collection in person and can be delivered locally for a small donation. All profits go to support local Ewhurst Cricket Club.